Hi Mums and Dads. My name is Nur Sarun. I’m a dental graduates from Indonesia and spent 2 years in clinical internship. Currently live in australia with my husband as postgraduate students in UQ. I’m staying at home at the moment. During my clinical years I have developed passion working with kids in the clinic and had also done some babysitting while bringing my little patients to the clinic. I have Blue Card and trained in first aid and cpr. I have a car and can pick up your kids from school/kindy if required. Hope to hear from you soon! I have about 1 year experience taking care of kids during my clinical years. I’m comfortable with any ages as I am also reliable in taking care of infant. I can play guitar and was in school drama team so you can ensure me to be a fun company for your kids! I have done home tutoring back in malaysia for maths, biology, chemistry and physics. 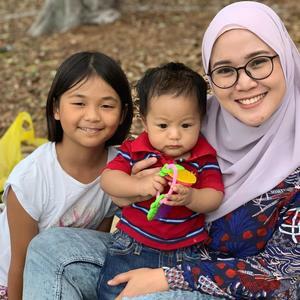 "My son loved Hanisah. Also, she was reliable, intelligent, and deligent. She sent me regular updates of how they were doing. Highly recommended."